2000 Topps Traded and Rookies Baseball marked the second consecutive year where the set came packaged with a rookie autograph. Sticking with the same design as the flagship set, 2000 Topps Traded and Rookies Baseball has a simple design that's distinct for its silver borders. Cards are numbered with a T to differentiate them from the main set released earlier in the year. The 2000 Topps Traded and Rookies Baseball checklist is definitely not lacking in the rookie department. Although many of the players failed to live up to their expectations, Miguel Cabrera is one of best of his generation. 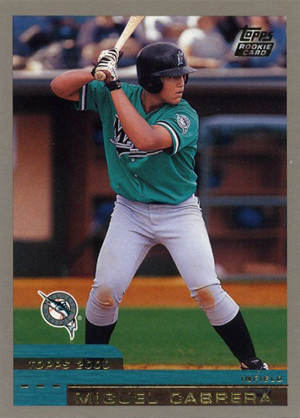 Adrian Gonzalez and Michael Young are the set's other key rookie cards. Besides the plentiful rookies, the 135-card checklist also tracks regular season player movement, showing stars in their new uniforms. Curt Schilling, Hideo Nomo, Will Clark and Dwight Gooden are among those featured. For many collectors, the biggest draw in 2000 Topps Traded and Rookies Baseball are the autographs. Inserted one per box, the take on the same design as the autographs from 2000 Topps Baseball. The 80-card checklist is only rookies and young stars. 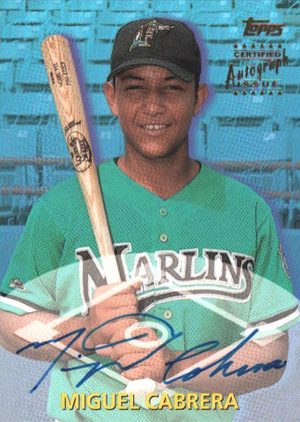 By far, the top card is Miguel Cabrera, which regularly trades for hundreds of dollars. 80 cards. Inserted one per sealed set. 2000 Topps Traded & Rookies Factory Sealed Box set 1 autographed card!